I have been to Selma, Alabama, at least three dozen times. My father grew up there with his grandparents and a gaggle of cousins. For much of his childhood, his front yard was a fifty-acre cotton field, and it was not uncommon to see a chicken running around with its head cut off. We visited our family there twice a year for most of my youth, but it only took my father telling me one story of being chased home by white men with bats and knives and hiding under a car in a junkyard, for me to understand why he left. My childhood memories of Selma are rooted in visiting my great aunt Sarah in her yellow and blue trailer just off of Highway 80. Half of the place was pink and half was light blue—her two favorite colors. My cousins and I played outside catching lightning bugs, shooting firecrackers, playing in the dirt, and gnashing on frozen Kool-Aid in foam cups. Going to Selma was always an escape from the daily grind, primarily because of its emptiness. 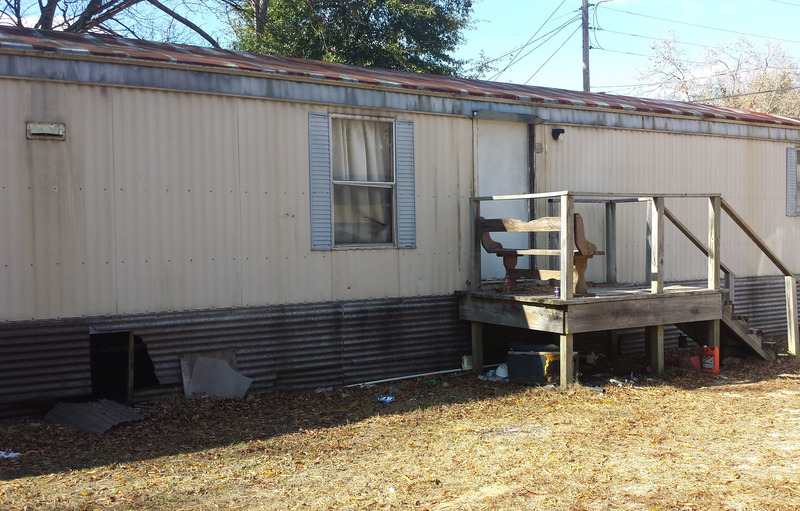 My Aunt Sarah lived in this trailer for over 20 years before she passed away in 2006. There was no Target or Starbucks, and there still is not. Selma has one of a few things and not a whole lot of anything, except history. Every year there is a commemorative march and jubilee street festival and concert to honor the civil rights activists who marched from Selma to Montgomery in 1965. 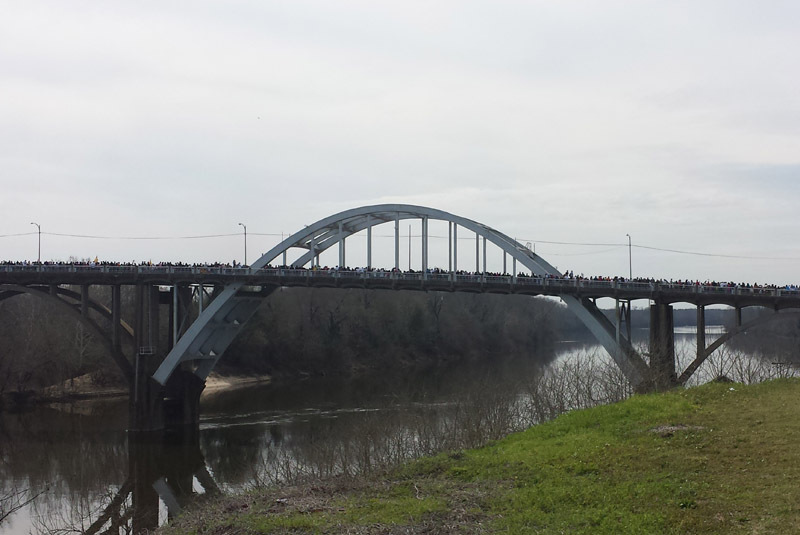 This year’s fiftieth anniversary celebration brought tens of thousands of people from all over the world to march across the Edmund Pettus Bridge, as demonstrators did five decades earlier. On Saturday, March 6, 2015, I, along with tens of thousands of others, stood in a security check line for three hours only to stand in front of a Jumbotron for another two hours in order to hear President Barack Obama speak. Congressman John Lewis introduced the president; Lewis, who along with Andrew Young and Martin Luther King Jr. marched for voting rights in 1965, said he never thought he would introduce the first African American president or be considered his hero. The march from Selma to Montgomery inspired people around the world to take their message to the streets. It is still inspiring movements such as the Occupy Movement and the Arab Spring. Marchers set up tent towns on the side of the road in 1965, just as occupiers set up tents in Central Park in 2011. These recent movements have been focused on creating and expanding opportunities for social mobility and economic prosperity, especially in communities of color. The Civil Rights Memorial sits at the foot of the Edmund Pettus Bridge. 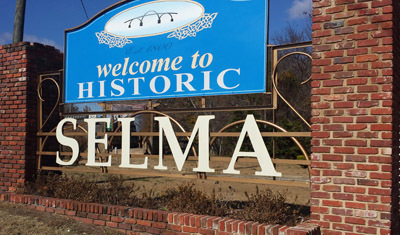 Selma is a prime example of a place in need of economic help. Forty percent of the population lives below poverty level, and there are abandoned buildings everywhere. The median household income is about $22,480 per year, according to the U.S. Census, and the population is 80 percent black. 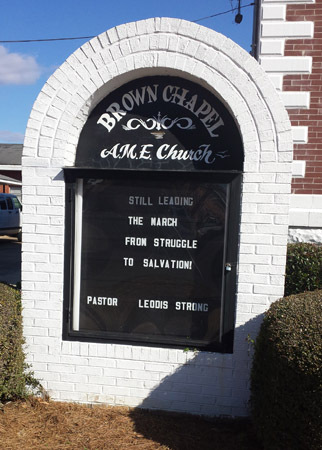 Andrew Young said in his speech at Brown Chapel Church on Sunday that “in Atlanta we were more focused on green and gold, rather than black and white.” Atlanta has become a black mecca, while places like Selma have faced population declines. On Sunday, March 8, Andrew Young, Al Sharpton, and others spoke at Brown Chapel before the commemorative bridge crossing. That evidence exists even in the town that time forgot. George Evans, the mayor of Selma, is African American. Terri Sewell was elected in 2010 as Alabama’s first black congresswoman, representing the district that includes Selma. There is hope for us yet, as long as we do not allow the torch to be extinguished.